Chef Carlo’s nightspot is now a restaurant. 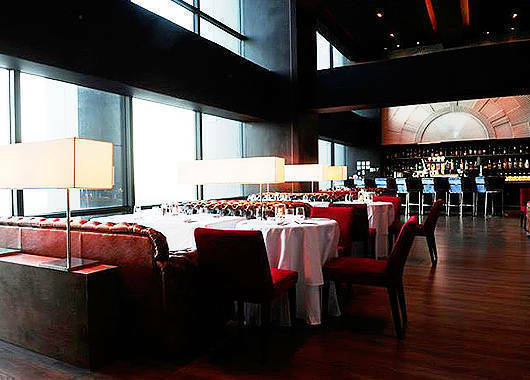 (SPOT.ph) There's a certain allure to dining with a view, and at 71 Gramercy, a view is what you get-and more. 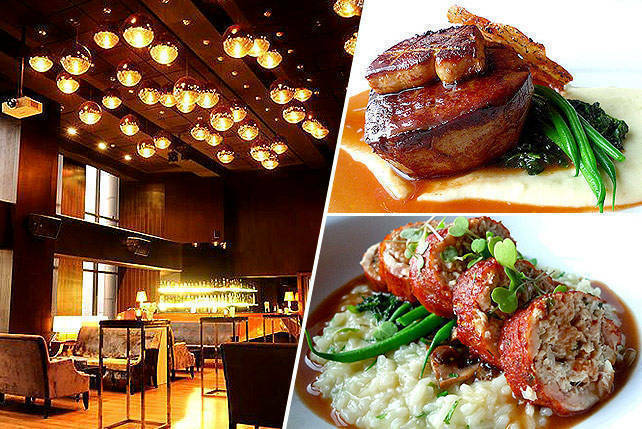 Located at the top floor of the country's tallest building, 71 Gramercy, one of today's hottest nightspots, recently opened its doors to the dining crowd. 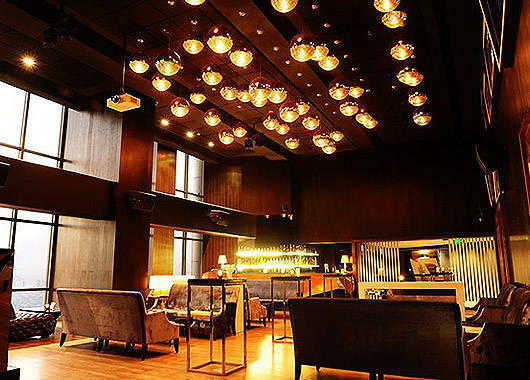 The club and restaurant are influenced by the building's New York origins, Gramercy being the name of a neighborhood and hotel in New York. 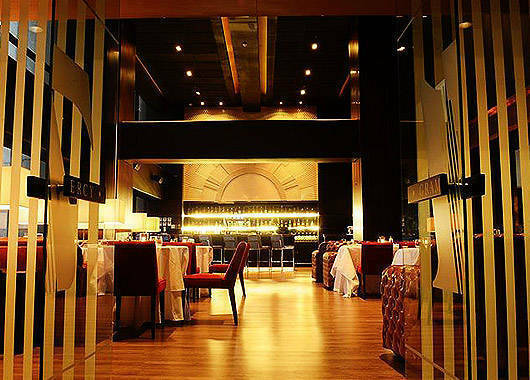 The interiors are stark and modern, with touches of art deco and a bit of a Jazz Age feel. "The Antonios of Century Property (Gramercy's developers) were interested in having a high-end restaurant, sort of like a crowning glory for their building," says Chef Carlo Miguel, who helms 71 Gramercy's dining room. High ceilings give it added class. The menu features familiar dishes done with a bit of flourish, featuring minimal but quality ingredients, as well as impeccable technique. The food has been described as "modern New York dining," and while located near the fine-dining end of the spectrum, 71 Gramercy is quite approachable, with dishes that will appeal to everyone on any occasion. As a celebration restaurant, they’ve really amped up the interiors. "There's a lot of classics on there but sort of reinterpreted my way," Chef Carlo says. "Considering we're up here, I realize that it's going to be a celebration restaurant as well, so it needs to be food that people understand, but I still wanted to make sure that the quality of the ingredients were topnotch (and) the execution is spot-on, but I wanted the dishes themselves to be a little understated, simple, in fact." Try the 62 Degree Egg (P290), an egg cooked in a circulator at 62 degrees-the temperature Chef Carlo has determined to yield the perfect firm white and runny yolk-resting on a nest of shoestring potatoes, grilled asparagus, crispy prosciutto, and a little bit of parmesan. "It's sort of food mimicking the nature of an egg sitting in a nest." The dish harkens back to Chef Carlo's more adventurous menu at Opus, but with a degree of playfulness that makes it fit with Gramercy's menu. You have to mix everything together to get the dish's full effect, the yolk coating everything in a beautiful sheen with just the right hint of flavor. The hash makes for an effective palette, offering texture while bringing out the subtle sweetness of the arugula. 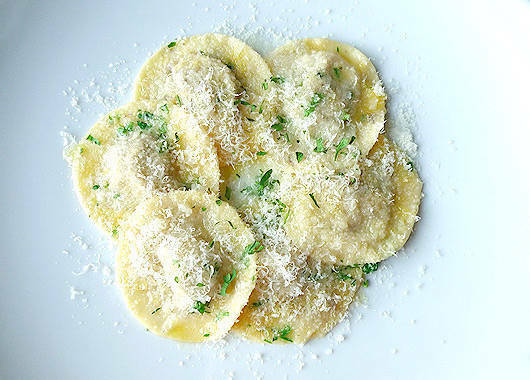 Everybody loves a good ravioli, and it's no different at Gramercy. The Mushroom Ravioli (P390) is a popular choice. It's deceptively simple, made with mushrooms, ricotta, truffle, and parmesan cheese inside housemade pasta. The whole thing is dressed with a little truffle oil, parmesan, and fresh herbs. "Really simple but when you eat it all together, it really sings," says Chef Carlo. 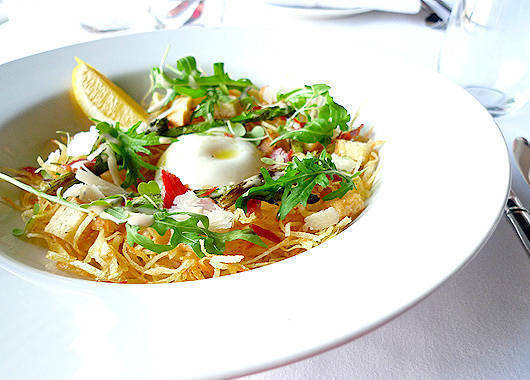 The dish is rich without being overpowering, the kind where you can appreciate the taste of the pasta as well as its ingredients. The Duck Sisig (P680) is his modern take on Filipino drinking food. 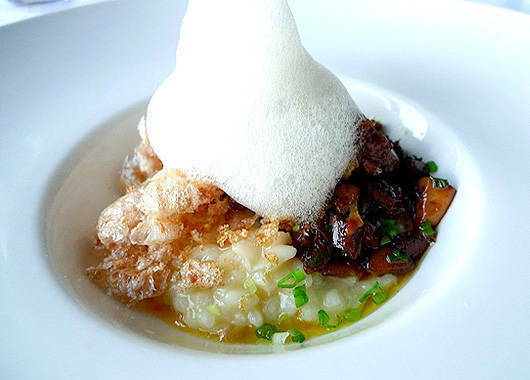 Bits of duck confit and foie gras rest on roast garlic risotto topped with calamansi foam. As Chef Carlo puts it: "The ingredients are a little bit more refined as well but when you mix it together, you think you're in Cable Car eating sisig." The duck is tender, the foie gras lending a fatty, melt-in-your-mouth aspect to the meat and the silky rice. 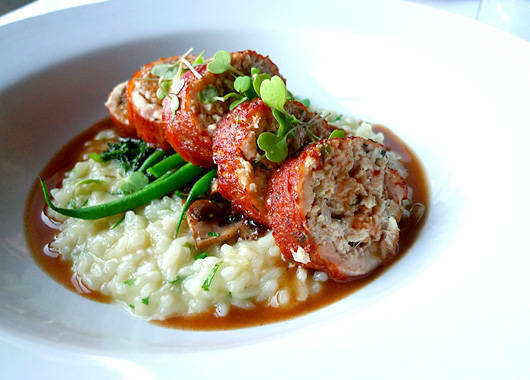 Another crowd favorite is the Chicken Ballottine (P380), stuffed roasted chicken leg on truffle risotto with spinach and mushrooms. The chicken is slightly crunchy on the outside, giving way to a juicy, meaty interior. Haricot vert adds color, crunch, and a bit of sweetness, while fresh mushrooms deepen the dish's overall flavor. The Tournedos Rossini (P1,480) is what Chef Carlo describes as "one of those modern classics that a lot of chefs have redone over the years, but actually stems from the last century." U.S. Angus prime tenderloin crowned with sautéed foie gras and potato galette then served on mashed potatoes and truffle jus. 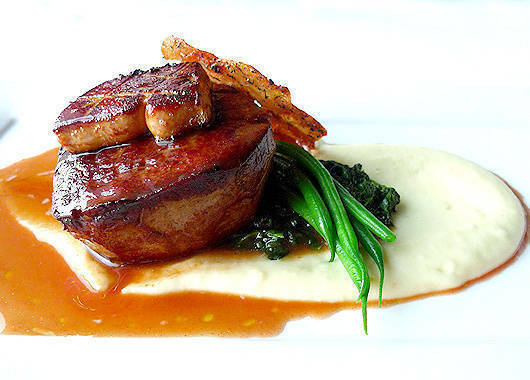 The steak is soft and juicy, the foie gras elevating an already luxurious piece of meat to something truly decadent. The restaurant has a short but impressive dessert list. 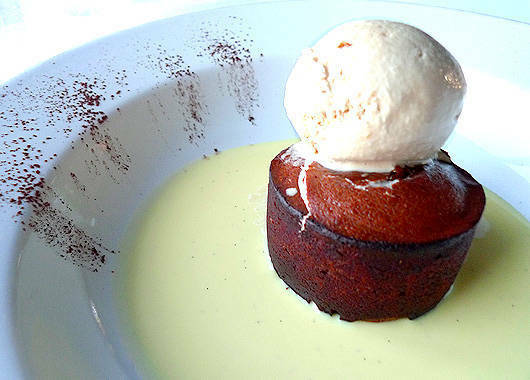 The Chocolate Fondant (P260) is a chocolate cake with a dark chocolate fondant center served with hazelnut ice cream. Much like their pasta, all Gramercy's ice cream are house-made. The cake is sturdy but moist, with a flavor very much distinct from the deeper chocolate that it holds within. The hazelnut ice cream makes the dessert less heavy-the bits of hazelnut adding a surprising and delightful touch. The Banana Tartetatine (P220) is a local variation on the traditional French dessert. 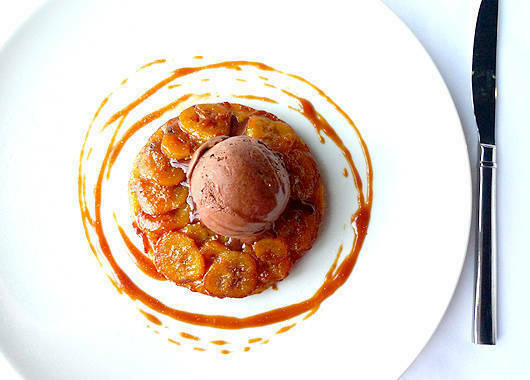 The caramelized banana tart, served with dark chocolate ice cream, is reminiscent of an amped-up turon. The tart is sweet, the caramelized top adding a beautiful burnt edge to the experience, a nice parallel to the dark chocolate ice cream. "I want it to be that go-to place in the Philippines," Chef Carlo says. "This is where you're going to propose. This is where you're going to have your birthday. 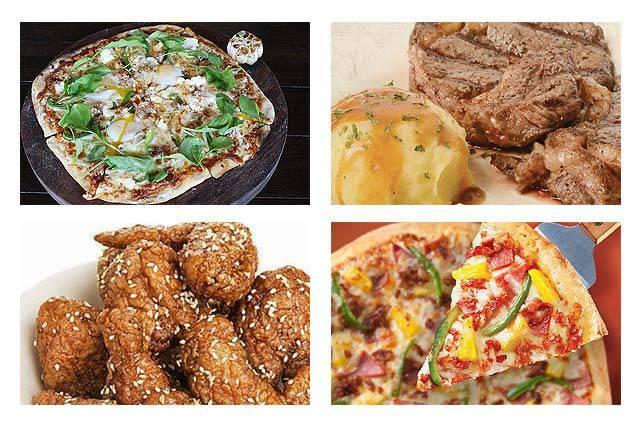 I really want (the menu) to evolve to see and work into what Filipinos are looking for." 71 Gramercy may have been open for dinner only more than a month, but it already looks to be as popular as a dining place as it is a night club. 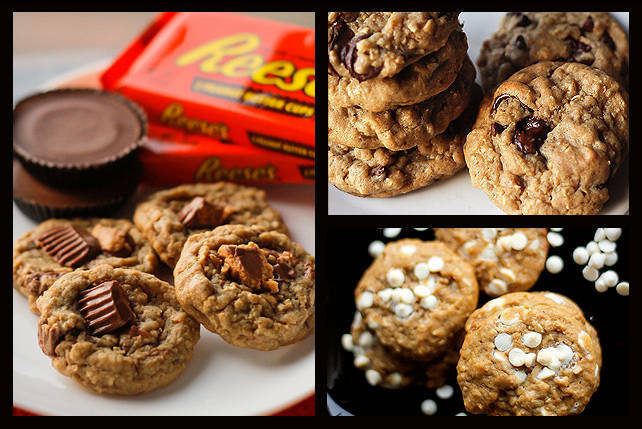 Homebaked, Perfectly Chewy Cookies by Cookies, Please!